Cooked: made mayonnaise! And a new kind of jam. Scientist Boyfriend has actually excelled in this this week: he made brawn (I know, I know…. actually tastes just like pork pie with no pastry, of which I am not a fan, but it was okay fried) and the most delicious bread rolls ever. Prepped: went to fleece workshop, used drop spindle, have been washing fleece; finished knitting sock, cast on second. Worked on local food systems: bit of seed/plant/produce swapping at the Ish meet on Saturday; cooked for lots of Scientist Boyfriend’s friends yesterday. 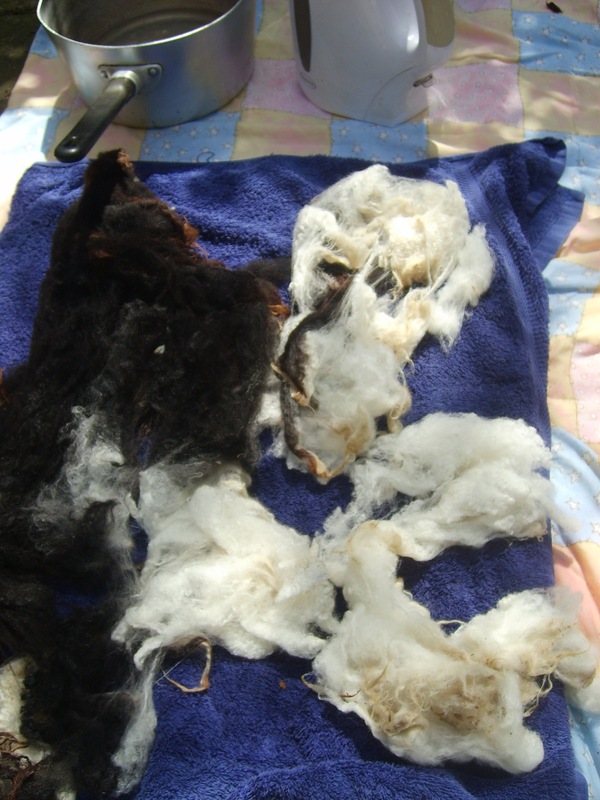 Here are a couple of photos from when I was washing the fleece the other day. I was told to put boiling water in a bowl/tub, put the fleece in, being careful not to agitate it too much in case it felted, leave it until the water cooled, then replace the water with lukewarm water, then again with cold water, changing it until it was clear. Here is my lunch from yesterday. 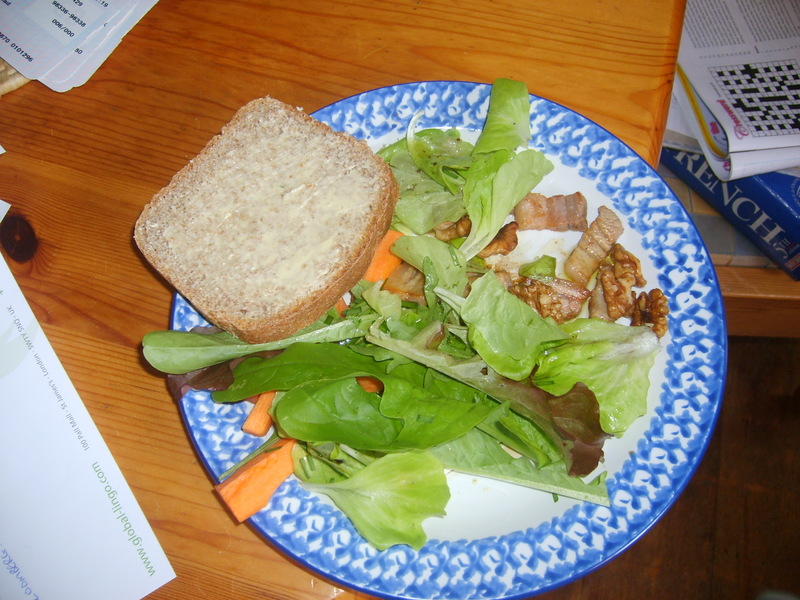 Seems like everybody (well, GTM and MrsL) are posting photos of what they eat atm. I probably won’t do a whole week’s worth, but I was proud of this one, because the salad was from the garden, so were the chives, I cured the bacon myself and Scientist Boyfriend had made the bread. Bought ingredients: 1/2 carrot, walnut, butter, oil and vinegar for salad dressing. And this one…. 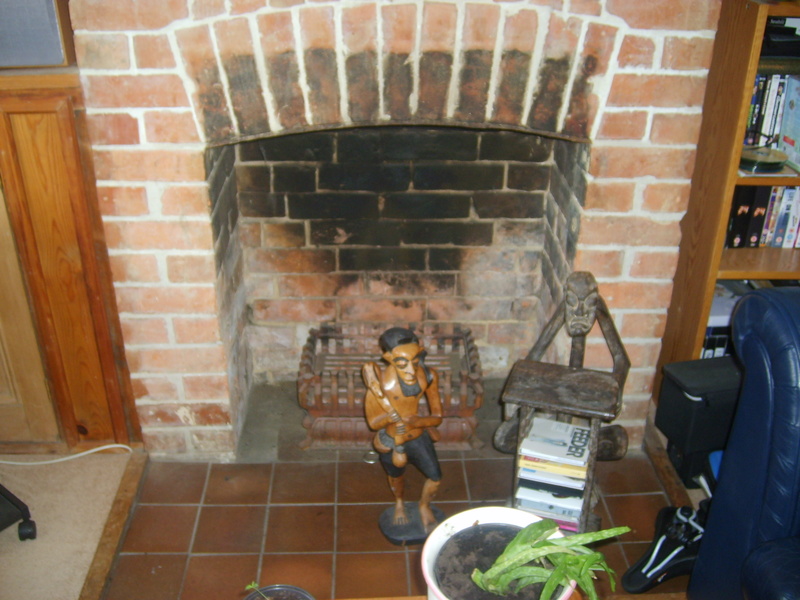 Well… Is this not just the perfect spot for a little lemon tree?…..
Avoid the post-apocalyptic chaos: get a piano! Yet I also look at my family now and feel much closer to them. My dad’s family have never been close – not that there’s ever been any animosity between them or anything like that, but they are a quiet, rather introverted bunch and he never rang his sisters for a chat or anything like that – and in the last year or so I have seen them all work much more at keeping in touch, at helping my grandma move, I’ve spent time looking at old photos and learning much more about my dad’s childhood. My parents make (and made, while my grandpa was ill) a lot of effort to go over and visit, taking gifts of things like shepherd’s pie, taking my grandma out for the day. I make much more effort to write to my grandparents, and visit them when I can, and help out my neighbour, who is quite elderly and lives on her own. I appreciate my own parents more, aware that they won’t be around for ever. If I am an optimist, it is more because I try to look for the best in people and in situations and I try to make things into positive experiences as far as possible, rather than because I always expect the best to happen. (I try to be baldly realistic in my prognostications for the future, imagining the best and the worst and trying to be prepared for anything, but mostly expecting something in the middle.) I’m not so Pollyanna-ish as to try to spin anything so awful and finite as death into a blessing in disguise, but perhaps it wouldn’t be unreasonable to say that as well as the sorrow, positive things have been born out of it also. I find that if I can put my grief to good use (by getting closer to my family and being to be kind to old people) it helps me cope with it better. Denial is useless; let in the bad, explore the bad, embrace the bad – it is part of you and part of life. But after a while, for god’s sake channel it into something useful. The more I’ve delved into this rather personal dark place, the less I feel that it was a useful comparison, but never mind. However, sometimes I do feel nauseatingly Pollyanna-ish (I do it for your own good, people 🙂 ), and I was wondering if perhaps I was coming off as painting too cheerful a picture of our post-oil future. After all, just because woodburners are nicer than gas central heating, and gardening and making jam are more fun than sitting at a computer all day, and if we had no telly and no internet Scientist Boyfriend and I would probably spend more time talking and playing Scrabble, doesn’t mean there won’t be a load of things I’ll miss (my iTunes playlist, 24/7 Bach if I want it… washing machines… not having to chop wood in Arctic temperatures…). And also, gardening and making jam are a lot more fun when I know Waitrose is just down the road. I made rhubarb and ginger jam yesterday, and effectively buggered it all up (though I might be able to sort it out), and if that had been my stock of rhubarb jam for the whole winter, the consequences would be a lot direr than just feeling slightly peeved that this lot didn’t work when all the other jam I’ve ever made set perfectly. Same when my pepper plant was dug up, or my pak choi got munched by slugs. I was thinking about this when I was spinning and when I was knitting my sock – back in the days when this was how all socks were made, people wouldn’t have had many pairs of socks! But overall, although there are certainly things I do that are unsustainable in the long-term, I find that rather than getting upset about not being able to have 24/7 Bach (do I really need something as wonderful as the Mass in B Minor or The Well-Tempered Clavier as mere background noise when I cook anyway? ), I’d rather put my energy into finding ways of… not replacing them, per se, but finding something roughly equivalent that I can carry on having. Like a piano. 🙂 As with food, being a producer as well as a consumer, as Mr Hopkins would put it. And so, when reflecting on the fact that I have been utterly let down by my education* and I’m going to have to pretty much teach myself (or at least actively seek out someone to teach me) all the skills I am probably going to need in order to thrive in my future life, I don’t find it very helpful to concentrate on the probable widespread poverty and drudgery, the potential for social disorder, or the possibility for days-long power cuts, or any of the Mad Max-type scenarios. I don’t deny they are a possibility, I just a) feel they are an unlikely one and b) can’t really do much about them. So I let that negativity in, the fear and the loss, but I then try and focus on the positives. Okay, so we won’t be able to travel as much, but we might find or create more to interest us in our local communities. Okay, so we might have to do more hard, outdoors, physical work, but we’ll have better food and probably be healthier. Okay, we won’t be able to blog and use internet forums as much, but we might write more letters and get more post that isn’t bills. And the internet, for all its wonders, is not an unalloyed boon: I have RSI in my right wrist (and really shouldn’t be typing this) and an irritating tendency never to get around to doing anything, because I believe I can do it any time, because somehow broadband creates that illusion in my mind. And the answer, I suspect, is [I am intentionally romanticising subsistence agriculture] a little bit, in the sense that I don’t think anything is served by my saying, “your future and the future of your children is drudgery and misery.” I think it is certainly possible that I elide some difficulties – or rather, that I prefer not to focus on them. Some of that is the optimist issue – I am one, despite my dark prognosis for our culture. And part of it is that ultimately most of the things that will necessarily get harder aren’t the things I value most. That is, I suspect our physical loads will get heavier. On the other hand, I suspect that will only be good for my overall health and wellbeing, so I choose to look at it not as a negative, but as mostly a positive. So that, really, is my plea to everyone who is worried and concerned about the future. Allow yourself to worry, get it out of your system, and then stop worrying. Decide that you are going to be aware of the bad stuff, and start examining the things in your life that you will miss and the things you definitely won’t and try and work out a way to compensate for the things you will. Think about the things you might look forward to and focus on them. Choose to see things as positive. Talk to your loved ones. Get a piano. Be nice to old people. Don’t overcook your jam. * Not the part at Oxford, where I was encouraged to think critically and manage my own learning, with occasional intervention from the finest minds in their field – the part at my hideous, pushy girls’ independent school, but that’s a story for another day. Here is Robert Newman’s History of Oil a stand-up comedy show about peak oil, which, apart from the rather tasteless part about composting the Pope, is excellent – just the kind of eccentric, erudite comedy I love. Watch it. Bizarrely enough, I found the link to it from the Girl with a one-track mind blog, which, yet more bizarrely, I was linked to by Almost Mrs Average. Funny old world. There’s a spinning wheel on ebay, for £49.99, about 20-30 mins drive away from me, good working order – what’s the catch? I also, somehow, unintentionally came away with some raw fleece. 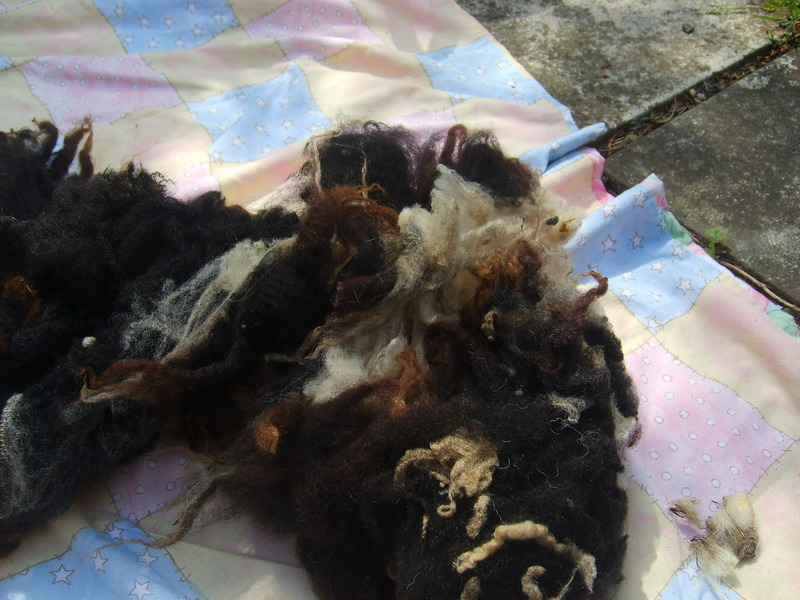 Quite a lot of raw fleece, in fact. Fortunately, Scientist Boyfriend was out running when I came home, so I hid it in the spare room, and yesterday I washed some of it outside while working. I have some pictures, which I’ll post when I have more time. Hmmmm. My next project was meant to be a hooky mat (see here for lots of fab rugs and instructions) and I had some hessian all ready. So many beautiful textiles, so little time….. When my parents moved to the country when I was about five, to live the good life at least at weekends, I was extremely excited about the prospect of the strawberry patch. I was extremely fussy about vegetables, but summer fruit – strawberries, raspberries, blackcurrants, redcurrants, nectarines, peaches etc – were top of my list of favourite foods and reasons for being alive. * We went on holiday that first summer and I was assured that on our return the strawberries would be ready to eat. ** My excitement mounted all the way home, and when we arrived we found that the sheep that were meant to live in the field behind our house had broken through the fence and happily munched their way through the entire crop. I was absolutely devastated, and this is probably a not insignificant contributor to the fact that I became a dedicated frustrated urbanite throughout my teenage years, until I left home and realised the town wasn’t all it was cracked up to be, and may also have been why my dad’s vegetable growing remained rather small-scale for many years. This morning, I discovered nefarious goings-on afoot in my garden. Some creature (probably a cat) had dug up one of my pepper plants overnight and left it on the patio. I popped it back in the grow-bag and gave it a good water, but it might not make it. What cheek! And a pepper as well. They’ve been causing trouble from the start. I had a germination rate of about 0.00005% and of that only one surviving seedling remains, and it’s still very much a seedling, not a plant. I managed to acquire three plants on Freecycle which are now happily, slowly growing in a sunny spot in my garden. And now, of all the plants the ruddy creature could have destroyed, it went for the least replaceable. Mr Sod, his law (again). I suspect a villainous feline. I might post confirmed cat-hater Scientist Boyfriend on sentry duty with a water pistol. I don’t think GM crops are going to cause us all to grow three heads. They might (after all, they assured us that feeding ground up bits of dead animal to other animals who were supposed to be vegetarians was fine, and look where that got us), and they’ll probably do strange things to the ecosystem, so it’s wise to be cautious, but overall, I think the whole ‘Frankenfoods’ thing is rather exaggerated. I don’t think it’s ethically wrong to genetically modify food. After all, scientists are just boys with their toys, that’s what they do. What is wrong is generally what people choose to do with a new discovery, outside the lab, rather than the discovery itself. to ensure food security for developing countries. That and take our water-intensive cash crops elsewhere. Autonomy is everything.